Step by step guides to the hand pollination of corn and squash as well as resources on rearing pollinators for your fields or gardens. Free downloadable resources for you to save and print, including a guide to Midwestern Native Pollinators. If you have winter squash in your garden that are ready to be harvested, these simple steps can help you store them a bit longer so that you can delay processing, seed saving, and pie making until later in the winter when you’ve worked your way through your less patient produce. Part of the responsibility that comes with maintaining a seed collection containing over 20,000 rare garden varieties includes testing for and eradicating viruses and diseases. This week the staff in our Preservation Department were busy performing ELISA tests (enzyme-linked immunosorbent assay tests) to identify any squash specimens infected with the squash mosaic virus (SMV). Roughly 1,000 seedlings were tested from 28 varieties. Prince George of Cambridge has been big news this past year, and so have our seeds in this royal collection! Just in time for the royal wedding anniversary, we've compiled a list of our most royally-named heirloom, organic, and open-pollinated varieties. Every seed we preserve is special in its own right, but these are sure to make your garden fit for a king or queen. The fifth annual Seed Savers Exchange Harvest Festival incorporated a celebration of squash with all the fun activities everyone has come to expect at the autumn event. The versatile and dynamic Cucurbita genus offers so much more than just pumpkins and zucchini, and the SSE crew was eager to show it off. Along with a beautiful heirloom squash display, attendees enjoyed a variety of gourmet squash soups, workshops on saving squash seed, a lecture on the origins and evolution of squash, and a talk on the culinary uses of different squash varieties. Festival-goers also helped press apple cider, sampled a variety of apples from the Historic Orchard, learned to plant and grow garlic, enjoyed a guided edible and medicinal plant identification walk, and learned to make broomcorn brooms. Turnout for the event was great despite the wet and cool weather, which was decided by all to be ideal conditions for the soup cook-off. The Harvest Soup Cook-off is quickly becoming a highlight for this annual event, where chefs from some of the most respected local restaurants enter a soup for attendees to vote on. In the days prior to the festival each chef was given a box of Potimarron squash, and each one showed up Saturday with a delicious and unique soup for the contest. After the ballots were cast and the votes were tallied, Chef Tom Skold of Albert’s Restaurant was declared winner of this year’s cook-off. Entering his Harvest Bean and Squash Soup, the chef admitted he had not handled the rare Potimarron winter squash before. He said of it, "With such a brilliant, colorful squash, I was really excited to use it," adding, "this is a transitional time where you can still get your fresh produce out of the garden as well as your fall crops. Everyone is interested in eating this time of year, so it’s really a good time to be a chef." Below you'll find Chef Tom Skold’s winning soup recipe. Download all of the mouth-watering squash soup recipes here. 1. Drain the soaking water from the beans, cover in fresh water, bring to a boil with a pinch of salt, and simmer until thoroughly cooked. 2. Preheat oven to 425F. Place the squash and tomato halves on separate baking sheets and drizzle them each with 2 T. olive oil, then season with salt and pepper. Roast the squash and tomatoes 45 minutes at 425F and reserve, cutting the tomatoes in large pieces when cool. 3. Heat the remaining olive oil in a large saucepan or Dutch oven. Toast the ancho chili on all sides and remove; when cooled seed and chop. Add the garlic to the same oil, toast golden brown and remove. Add the onions to the same oil and cook until caramelized. 4. Add chicken stock, rosemary, cooked beans, reserved squash, tomatoes, chilis, and garlic to the pot and bring the soup to a boil. Puree part of the soup to thicken, season to taste and serve topped with the grated cheese. Seed Savers Exchange is a non-profit organization dedicated to conserving and promoting America’s culturally diverse but endangered garden and food crop heritage for future generations by collecting, growing, and sharing heirloom seeds and plants. *We are now accepting internship applications for the 2014 season. *Click here for details. I discovered my passion for growing plants after spending a summer working for a local nursery in Helena, MT as a teenager. Several years later I decided I wanted to continue my quest for plant knowledge, and I enrolled in the Sustainable Foods and Bioenergy Systems program at Montana State University. It wasn’t until recently, however, that I developed an interest in saving seeds and seed production after picking up a copy of Suzanne Ashworth’s book Seed to Seed. When the time came to choose an organization to satisfy the internship requirement for my degree, I looked to Seed Savers Exchange (SSE). With the help of Tim Johnson (Seed Bank Manager at SSE), the arrangements were soon made and I headed to Decorah, Iowa for a five-week immersion in seed-saving. I arrived about a week before the annual conference—which I soon found out was a three-day gathering of dedicated seed savers from around the U.S. It was inspiring to be among so many people who were as crazy about plants as I am. For me, the highlight of the conference was helping with Mary Ann Fox’s bean collection legacy distribution (read about it here), of which I committed to growing, saving, and sharing four of her varieties. Needless to say the conference was an incredible experience that I was thankful to be a part of! The main objective of my internship, however, was to learn how to hand pollinate (HP) corn and squash. In order to save pure seed from corn, the ears have to be bagged before they push silks out to prevent cross-pollination with other varieties. These bagged ears are checked daily until the silks emerge. Once the silks emerge, the tassels get bagged so that pollen can be collected the following morning. Pollen from dozens of tassels of a single variety are sifted and combined to ensure the subsequent seeds carry the traits of multiple plants. About a teaspoon of pollen is then poured onto the exposed silks of each bagged ear. The ears are quickly re-bagged after pollination and remain covered until harvest time. In a population of 300 plants per variety, SSE’s goal is to obtain at least 200 ears of corn. Corn HP is a hard job that often left me covered in pollen and rashes, but it was rewarding to know that I was helping to preserve varieties that may otherwise be lost. Squash HP isn’t as complicated as corn, but still requires a bit of work. The process starts in the late afternoon with the search for male and female flowers. Staff members scout for closed flowers with yellowing corollas, a sign that they will open the next day. These are pinned shut to prevent insect visitors from pollinating the flowers. To reduce the chance of spreading disease, pollination starts after the dew has dried the following morning. At SSE, three male flowers are used to pollinate each female to ensure good fertilization and a mix of genetics in the resulting seeds. The males are collected and their petals removed to pollinate the females, which are then taped shut and labeled. Trying to do all this before a bee comes along can be a challenge! During my internship I also helped in the diversity garden, weeding and pruning plants alongside SSE Co-Founder Diane Ott Whealy (an unexpected treat! ), helping with plant evaluations and taste testing (perhaps the best job at SSE! ), germination testing (there’s much more to it than you’d think), and inventorying seed in the seed lab. The last week of the internship was set aside for me to reflect upon what I had learned and to develop a display for the diversity garden that communicated the techniques of squash HP. My internship at SSE was an invaluable learning experience. Being able to see the many different aspects of the organization was a fun and helpful way to learn about seed saving and the role that SSE has played in preserving our agricultural heritage. The staff members are all fantastic, fun, and dedicated people who were excited to help me learn everything I could while I was there. Seed production is an often overlooked aspect of agriculture and saving seeds is an important skill for anyone wanting to garden more sustainably. More importantly, seed saving and sharing is a great way to bring families and communities together and re-establish local food systems. If you are a student who is interested in sustainable agriculture, I would highly recommend learning how to save your own seeds and to consider SSE’s internship opportunities. If you are interested in pursuing an internship with Seed Savers Exchange, contact Renata Christen at renata@seedsavers.org for more information. It's that time of year again when gardeners everywhere are seeking out creative ways to utilize the abundance of zucchini and summer squash coming out of their garden. Of course, here at Seed Savers Exchange we can't help but to encourage you to try your hand at saving seeds for next year's garden (scroll down to find a how-to guide for saving zucchini seeds). If you're interested in maintaining the characteristics of your variety in the next generation, you'll need to make sure your plants weren't cross-pollinating with other varieties. Of course, it can be fun to have a little backyard hybridization, too. Select one or two zucchinis to leave on the vine and save their seeds, then have fun with the rest! Make zucchini breads, cakes or soups that can be frozen and enjoyed later; Donate to a local food pantry or drop some zucchini on a neighbor's porch. Brown and season ground beef; set aside. (Omit beef for vegetarian option). Sauté onion and sliced zucchini in the olive oil for 10 minutes; season with salt and pepper. Add the tomatoes; simmer for another 10 minutes. In a large buttered casserole dish (2½ quart), layer the ingredients in the following order: half of the vegetable mixture, half of the uncooked rice, all of the ground beef, the remaining rice, and end with the remaining vegetable mix. Cover and bake at 350 degrees for 45 minutes. Remove from the oven, uncover, sprinkle the grated cheese over the top, and return to the oven, uncovered, for a few minutes, just until the cheese melts. Find more seed saving tips on our website. Kent and I first met Tom and Sue Knoche in 1981 when they attended the first Seed Savers Exchange campout in Princeton, Missouri. I recall how the first thing Tom said after giving affectionate hugs was, "I drove over 650 miles to get here! I have never met anyone in my life that I could talk to about my collection of seed. I always gardened with my granny and we saved seeds. No one else ever understood or shared my excitement." Tom once said, "My grandma is going on eighty-nine years old, and she's said all her life that no bean was worth eating unless you had to string it first. A lot of the old folks say that about the string beans." Tom was known as "the squash collector." When asked about his squash collection in the early 1980s, Tom said, "The squash that I've collected and that I'm the most concerned about are the large-fruited ones. These types are dying out so fast that there is no way they're going to be preserved if somebody doesn't take an interest in them. People want the little tiny handy size. Nobody wants to raise the large family sized types anymore. If I were to take some of my precious squash to our County Fair, there'd be no place for them. They have everything so categorized that if mine isn't a Hubbard or a Butternut or a Bush Scallop, there's no place for them. That's how bad things have gotten. And how on earth are young people ever going to know that there's anything different? I went to the State Fair for several years and tried to acquire seed from some of the growers. But there's so little interest that they don't even bother anymore to put the names of the growers on the specimens at the State Fair." Tom and Sue were early members who truly loved Seed Savers Exchange. We cherish their spirit, enthusiasm and expertise that gave SSE the courage to move forward with our mission over 35 years ago, a time when no one else was noticing. John Swenson, another long time member, once had a wonderful description of those who have joined us over the years. "Of those who have contributed over the years," he said, "they become one of the sparkles on a gem." We will miss Tom's stories, but his spirit and seeds are very much alive in our organization. There is one sparkle on that gem that shines brighter today. Over three decades ago Kent and I wanted to meet our early members to hear their voices. The last time I saw Tom was at the Seed Savers Exchange 2011 Campout. I am somewhat comforted knowing we recorded his voice and stories to be heard again by the new members of Seed Savers Exchange. Are there stories in your life that need to be recorded? "I may not be a very big grower anymore, but I am thankful that I could contribute to the ongoing success of the Seed Savers Exchange." This Valentine's Day, Say it With Seeds! Do you have a special someone to woo on this Valentine's Day? Rather than the typical box of chocolates or bouquet of flowers, consider the gift that keeps on giving: Heirloom Seeds! Maintaining and distributing unique heirloom and open-pollinated seeds is the primary goal of the Seed Savers Exchange (SSE) gene bank. The Evaluation Program is an important link between maintaining varieties at Heritage Farm and getting them into the hands of gardeners, chefs, and farmers. The Evaluation Program, which is only three years old, was started with the financial support from people like you. The program allows us to collect data on a variety’s traits throughout its life cycle. This data includes characteristics such as plant height, flower color, days to maturity, and fruit size. In 2012 staff recorded more than 40,000 evaluation descriptors on over 1,000 different accessions. The program also evaluates culinary usage—incredibly important in a world of unsustainable eating and forgotten food cultures. Modern fruits and vegetables bred for shipping and uniformity lack the diversity seen in heirloom varieties—like beets, potatoes, cabbages, and apples that store for months in a root cellar; horticultural beans harvested between the snap and dry bean phases for their higher protein content; and melons best suited for baking. The forgotten traits in these varieties are the building blocks to a sustainable food system. Increase our knowledge about each variety and make that information available to gardeners. Make informed management decisions about the collection by developing a comprehensive profile of each accession. Reintroduce unique and rare varieties into the marketplace. For the first time ever, Seed Savers Exchange is offering a collection of varieties ‘From the Preservation Gardens’ in our catalog this year. These varieties were selected because of their interesting histories, unique characteristics, and popularity with staff—a direct result of the Evaluation Program. Join us in our efforts to preserve our garden heritage for future generations to come. With your financial support for the Evaluation Program, we can rediscover our food culture—one variety at a time. A tax-deductible donation to Seed Savers Exchange will help us continue to maintain genetic diversity through projects like the Evaluation Program. Support our effort by making a donation or becoming a member online today, or call us at (563) 382-5990 (M-F, 8:30 am – 5:00 pm Central Time). P.S. 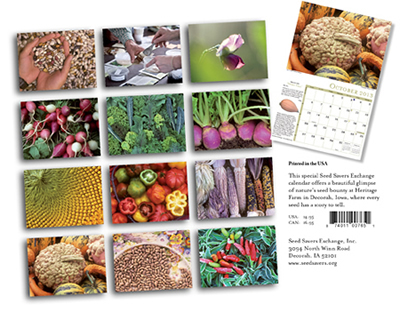 Donate $150 or more before December 31, 2012 and receive a free Seed Savers Exchange 2013 Calendar, which offers a beautiful glimpse of nature's seed bounty at Heritage Farm near Decorah, Iowa, where every seed has a story to tell. Eating beans from the pod, when the beans are fully expanded but not yet dry, is becoming a lost culinary tradition in America. The plump, wet, beans do not store well, and they are difficult to shell mechanically because the tender beans cannot tolerate rough handling. For these reasons, shelling beans have been shunned by industrial agriculture. However, the flavor is rich and shelling beans are richer in nutrients than dry beans. We added a horticultural bean taste test to our 2012 bean evaluation and found that most beans taste good as shelling beans, and some taste really good! Many that performed well in our taste test were not necessarily known as shelling beans historically. For example, “Bessie” (Bean 6042) has been passed down maternally in Frances Sullivan’s family for over a century, each generation using it primarily as a green bean for fresh eating and canning. This variety really caught our attention in the 2012 taste test. We described it as having “excellent robust flavor, sweet and slightly tart, low-medium acidity, firm and meaty texture but still juicy, great as a slicing tomato.” Curious about the variety, we investigated its history and discovered that it is mis-named in our collection and should be called “Djena Lee’s Golden Girl.” We are not the first to notice its outstanding flavor. It is promoted by Slow Food USA’s Ark of Taste, and won the Chicago Fair’s taste test 10 years in a row in the 1920s and 1930s. Though historically, women played a central role in developing and improving varieties in America’s gardens, Djena Lee was one of the few female plant breeders who enjoyed recognition for her efforts in early 20th century America. Most kohlrabi reach market maturity in 50-60 days and quickly become woody if left in the field. For that reason, we complete our market mature evaluation at 60 days. One variety in our evaluation grow-out, ‘Giant Czechoslovakian,’ did not form a kohlrabi head at 60 days. We thought it did not care for the spring weather. But in our fall grow-out of the same varieties, it again produced no stem-swelling at 60 days. We began to question whether it was really a kohlrabi, or if our seed-stock was compromised by crossing with another Brassica oleracea. We researched similarly named varieties in commercial catalogs, promoted as a 130 day maturity kohlrabi that does not get woody even when large. Then we went back to the long-forgotten spring planting and found enormous kohlrabis! Harvested at 176 days, they tasted great! This squash’s oblong shape, size, and dark green mature color make it look somewhat like a cucumber. A staff favorite as a winter squash, this year we evaluated this pepo squash as a summer squash as well. To our surprise, ‘Dostal’ turned out to be a favorite 2012 summer squash - with its dense flesh and mildly sweet flavor. It went on to win accolades again in the 2012 winter squash taste evaluation for its buttery, smooth texture and complex, rich flavor. ‘Dostal’ has proven that we cannot make assumptions about the versatile varieties in our collection based on the limitations of more modern, highly specialized varieties.